In the 1850’s, the Oregon state government attempted to empty the area now known as Portland, and 2.5 million acres of western Oregon, of indigenous people. This was undertaken through violence, and the Oregon Donation Land Law (which extinguished Indian land title and treaties, and made the land available in 640 acre claims to white settlers). But then a century later, indigenous people were brought in from rural reservations by the thousands through urban relocation programs attempting to find employment for, and assimilate Native people. Today in Oregon there are nine reservations, representing several confederated tribes, as well as a sizable urban Native population. 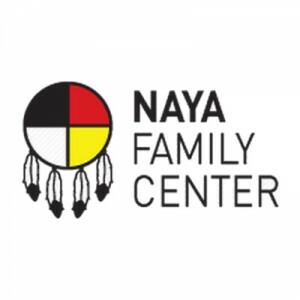 Portland’s Native American Youth and Family Center (NAYA) provides services to 9,000 urban Native residents a year from 380 different tribes. 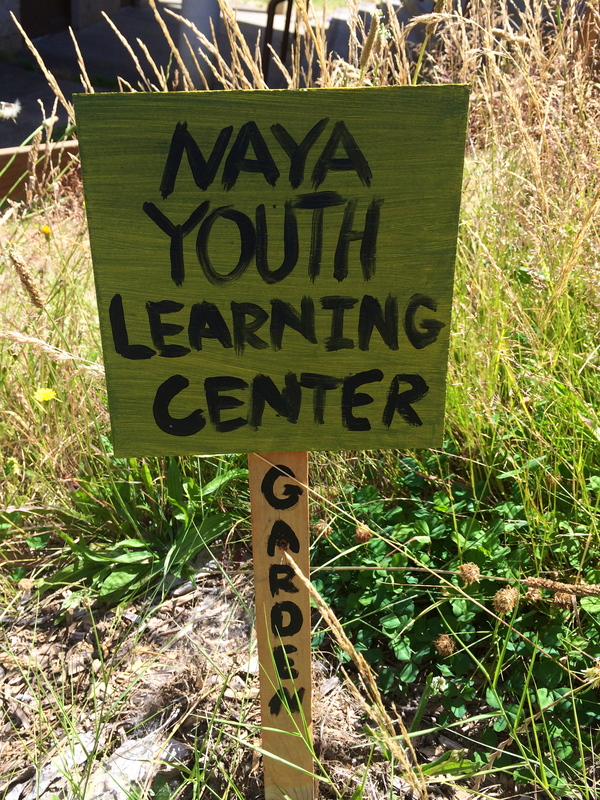 NAYA was founded by parent volunteers in 1974 and became a 501c3 organization in 1994. Their mission is “to enhance the diverse strengths of our youth and families in partnership with the community through cultural identity and education.” They promote healthy living through positive alternatives to high-risk behaviors and work to educate participants about the importance of community, the environment, and culture. 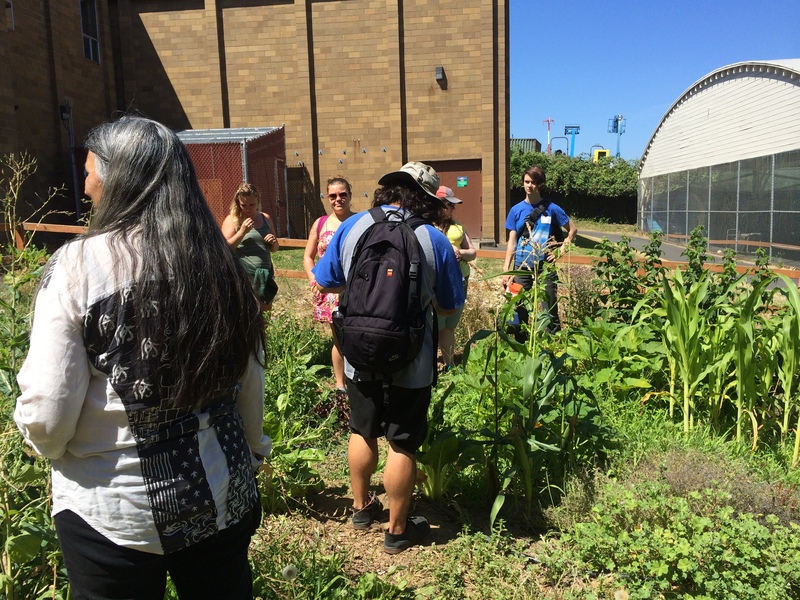 We stopped by NAYA on July 17 to visit their gardens, and to take part in Professor Judy Bluehorse Skelton’s “Indigenous Gardens and Food Justice” class that she teaches through Portland State University, where she is a Senior Instructor in the Indigenous Nations Studies department. 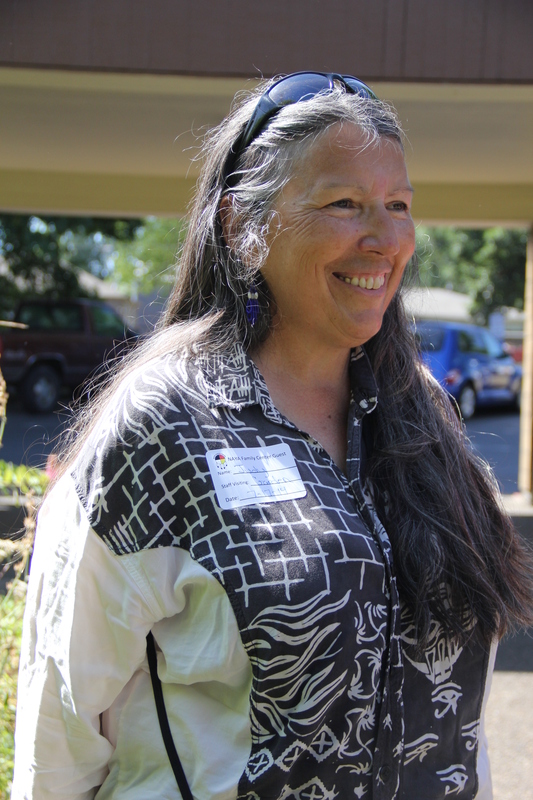 Judy, who is Nez Perce and Cherokee, combines her degrees in Education with her knowledge of ethnobotany to create courses that focus on community engagement, and the preservation and utilization of indigenous plant knowledge. 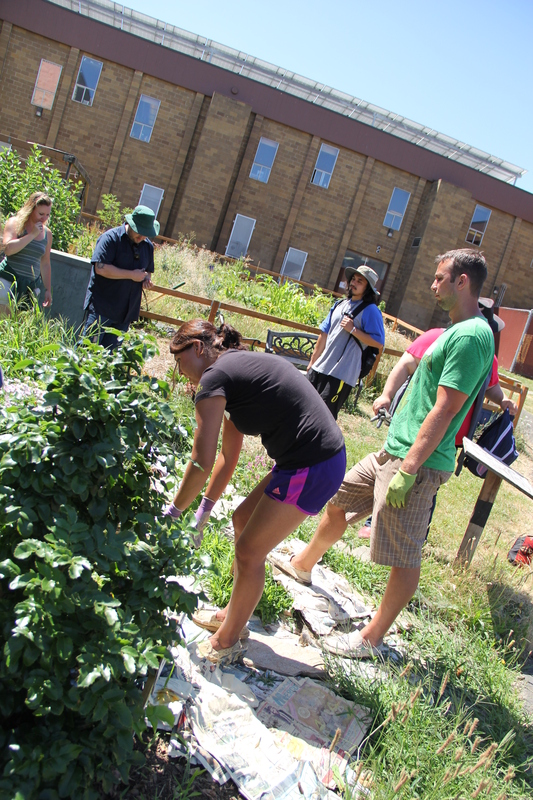 We had the good fortune to tag along with Judy’s students and NAYA staff members to help pull some weeds in the various NAYA gardens, learn about edible wild plants, and hear about future plans to build an urban park focused on indigenous culture. We started at the front of the building, in a small, dense garden of wild food plants like camas lilies. Camas is a perennial plant that grows from an edible bulb, and was an important traditional food for Native people because it was a rare source of carbohydrate in a diet that would have otherwise been high in protein from fish and game, and rich in berries. Camas tend to grow in moist meadows, woods, prairies and hillsides, but Judy is working on encouraging them to grow in more accessible places, like the front yard of NAYA. Earth Day flier. 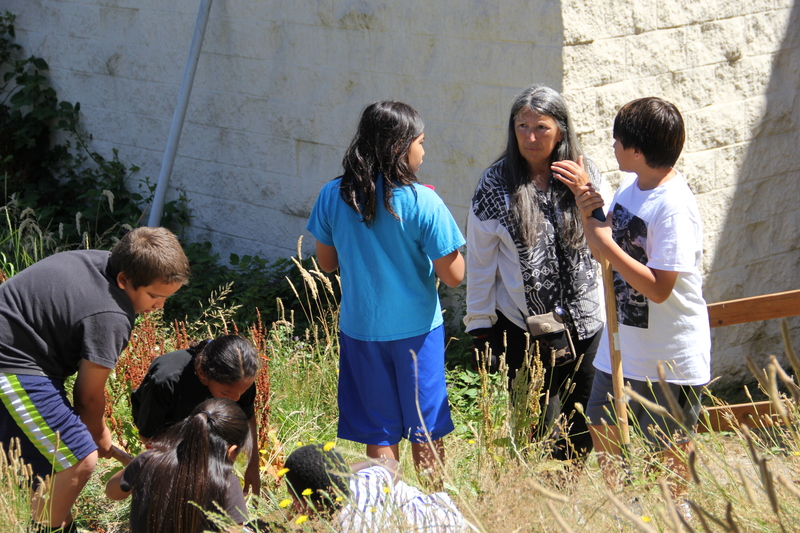 Seeds started by the elders program were planted in the demonstration garden. 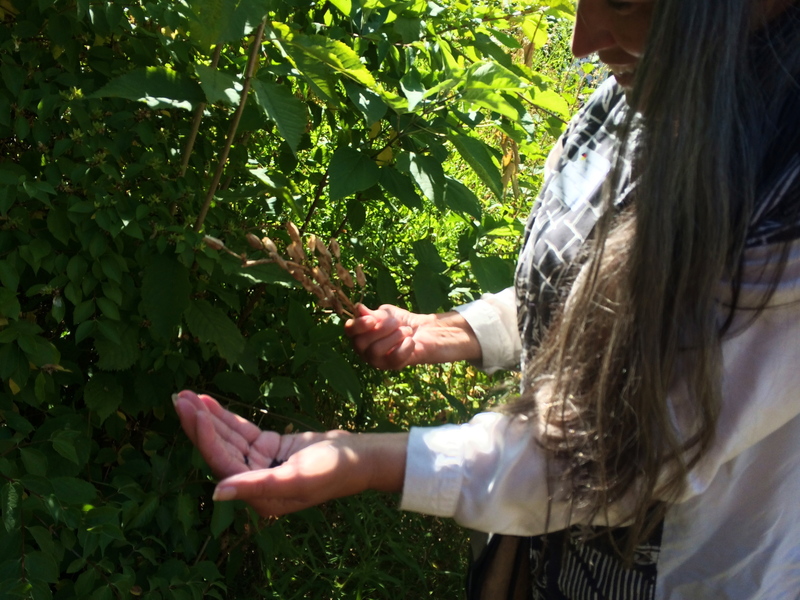 After a tour of the gardens, Judy led us on a wild plant walk through the woods, pointing out edibles (like the Himalayan blackberry, which are as delicious as they are invasive) as well as plants to be avoided, like poison sumac. NAYA land abuts Whitaker Ponds Nature Park, which houses a pavilion with a living roof that serves as an outdoor classroom, and a Lewis and Clark Garden, which “honors the expedition’s contribution to our knowledge of Northwest plants.” The garden is filled with “plants found in the pages of the explorers’ journals,” according to a sign along the trail. 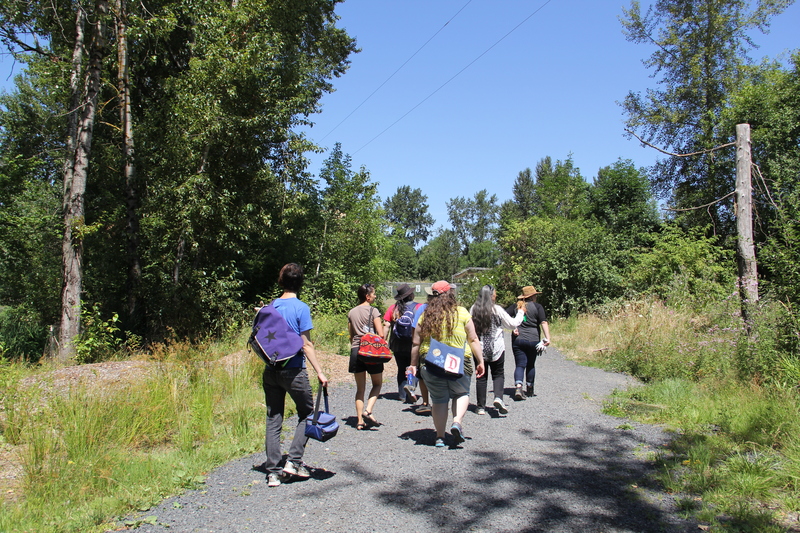 Judy described to her students how the region is currently involved in a “recovery from discovery,” noting that in the Northwest, as demonstrated by the signs, the Lewis and Clark discovery has come to define the region, right down to the names of the plants. 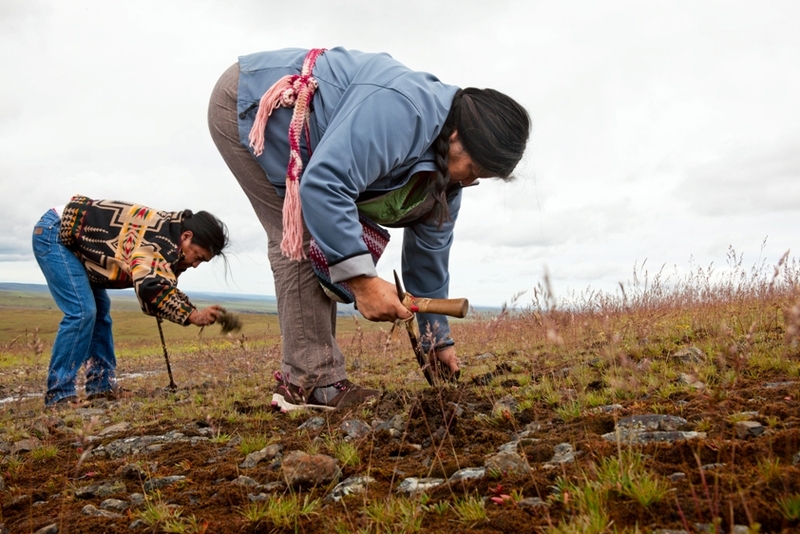 Indigenous people are in the process not of restoring, because she feels that word implies trying to get back to a fixed place in time, but rather re-indigenizing and re-connecting with plant relatives and assisting in the regeneration of ecosystems. Judy prefers “regeneration” to terms like stewardship, which imply a hierarchy and neglect the relational way in which she interacts with plants. 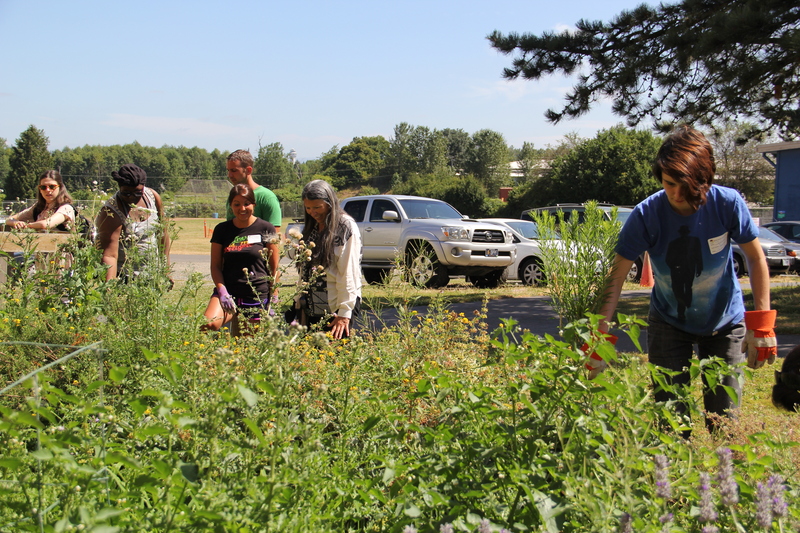 Similarly, supporters of the future Indigenous Gathering Garden at Cully Park cite that healing of the community will come through healing the land and restoring indigenous plant varieties. 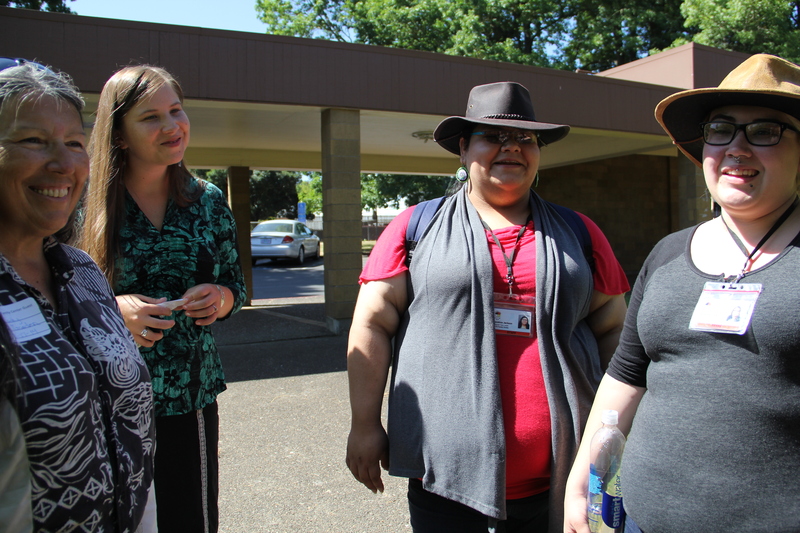 A major project that Judy and NAYA are currently involved in is the development of the 40,000 sqare foot Intertribal Gathering Garden at the future Cully Park. From the 1950’s to 1980, the site selected for Cully Park was mined for sand and gravel. When mining operations ended, the large pit left behind was lined with a geomebrane and used as a landfill for construction waste. It was capped and covered with a foot of soil in 1991, and in 2000 it became the property of the City of Portland. 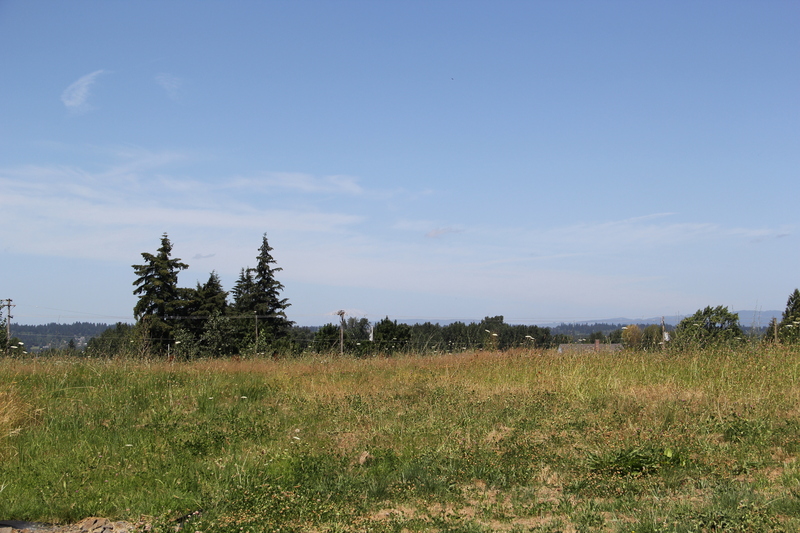 Today the site looks like 25 acres of rolling grassy hills, albeit with a system of methane control, and a leachate collection system that pumps leachate to the city’s sewer treatment plant before it is discharged to the Willamette or Columbia Rivers. The City of Portland Brownsfield Program is partnering with Portland Parks and Recreation, Metro (a region-wide planning and land use council,) and Let US Build Cully Park!, a a collaboration of 15 community-based organizations, including the Columbia Slough Watershed Council, the Cully Association of Neighbors, Hacienda CDC, Latino Network, Native American Youth & Family Center, Portland Community Reinvestment Initiatives, and Verde to develop this site into a park. To get buy in from the local community around building a park on a brownfield site, local residents were involved in sampling the soils on site to ensure the space would be safe as an area of congregation and recreation. Attention is now focused on the design and building of the Intertribal Gathering Garden, which is being designed by the local Native community and landscape architect Paul Agrimis. The space will include a Medicine Wheel/Healing Garden; a multi-use gathering area for outdoor education, events, storytelling and other culturally important activities; and raised earthen mounds to define the space and block strong east winds. The space set aside for the Gathering Garden is 50 feet above the rest of the neighborhood, offering views of Mount St. Helens, Mount Adams and Mount Hood. 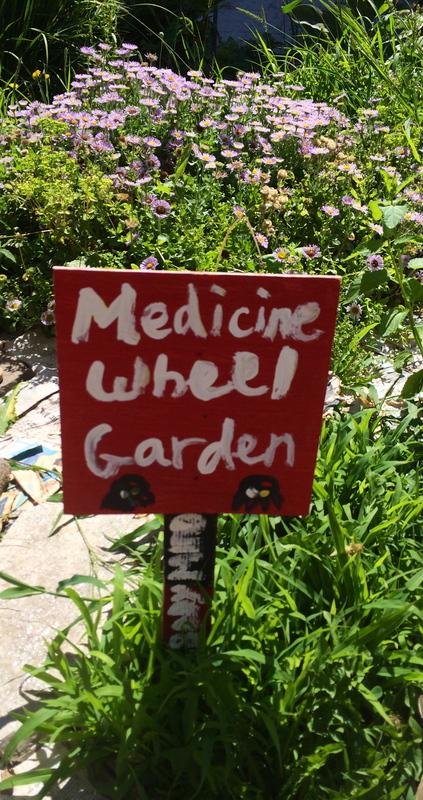 The medicine circle being designed in the garden will recognize the four directions as well as those important landmarks. They are also planning a trail that will link to a 3-acre north slope that is being planted to mimic the terrain of Mount Hood. In collaboration with the Xerces Society this slope will be planted with milkweed and other plants important to pollinators. 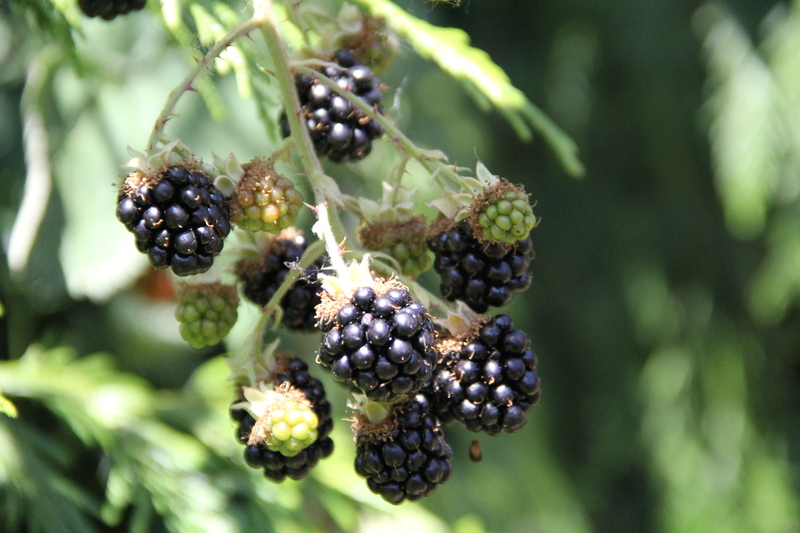 Plantings in the Intertribal Gathering Garden will reflect northwest indigenous food and basketry culture, and will include plants like berry bushes, red osier dogwood, red alder, and ginger. 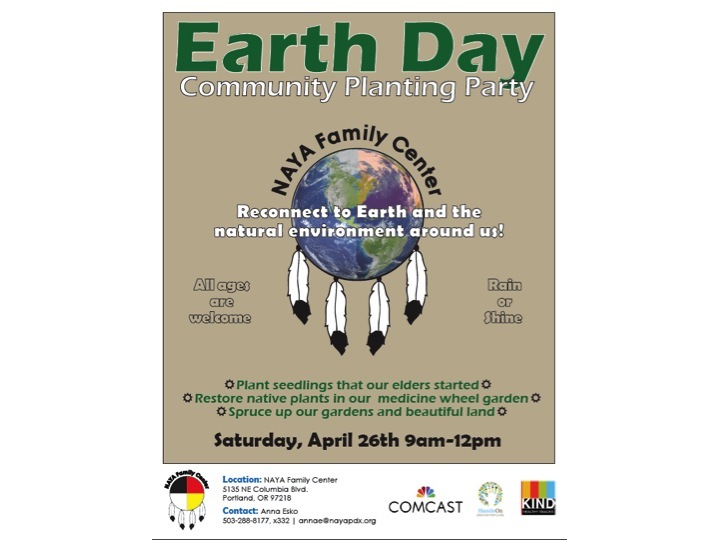 The intention is for urban and tribal community members to be able to come to the gathering garden to learn about seasonal harvesting, basket making, and wildlife. 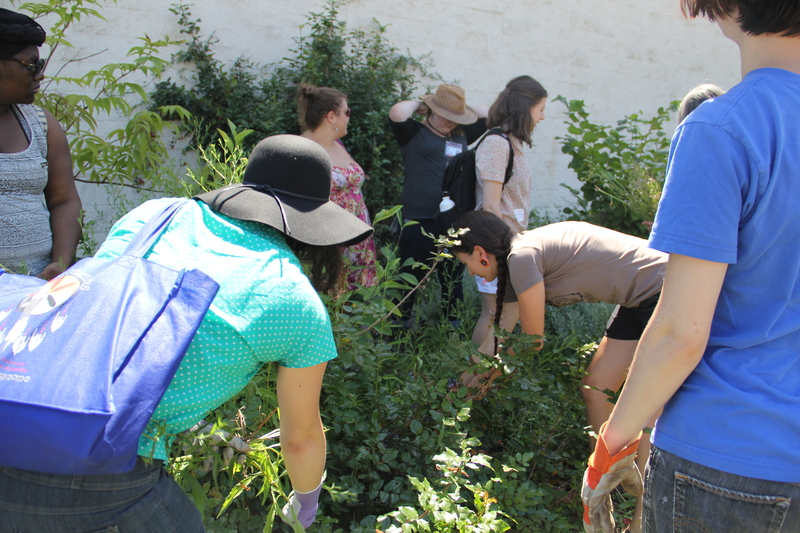 Portland Parks generally have a no-pick policy in their parks, and so this process of working with the community to develop a space that encourages harvesting has been a learning process for them. 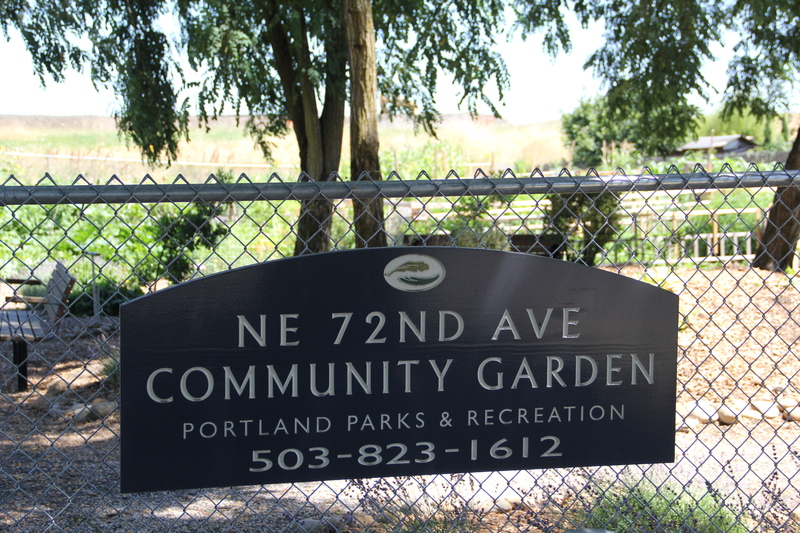 Judy sees the Intertribal Gathering Garden as an important tool in helping urban indigenous people redevelop their relationship with the natural world that has been diminished as Portland has become more industrialized. Her expectations are pragmatic; “will we feed the whole Portland Native community? Probably not, but it gets folks thinking about these plants and why they’re important.” Looking down at the camas seeds in her hand, she continued “We’re already looking at other land and projects to scatter these seeds. The people and the seeds really.” The exact completion date of the Gathering Garden is still up in the air. Judy and the local Native community have been hosting land blessing ceremonies for the past two autumns, in which participants are given wildflower seeds to scatter over the ground. They will likely continue these activities until the garden is completed, as a reminder to the community and the land of what is to come.